There are many different types of ghost hunting equipment that an individual can elect to purchase for their hobby, or their paranormal profession. For as far back as we can document, intrigue about the life that each of us may experience after we leave our current lives has been a hot topic! We draw from several different fields in order to discover the answers to the questions that we currently have regarding life after death. Spiritual beliefs, science, psychology, and even philosophy may a large role when it comes to determining exactly what happens once we pass to the other side. For many, ghost hunting is the solution. If you want to try your hand at ghost hunting, you will need to gather up some ghost hunting equipment. Here, I will share with you the most popular types of equipment in this field. 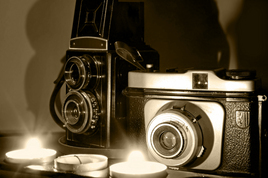 Digital cameras and basic photography cameras are an absolute necessity when it comes to ghost hunting. In many cases, individuals may capture something on standard camera film, or in their digital pictures that they did not capture with the naked eye. Based on their experience, it is absolutely imperative to understand the value of these equipment pieces. It has been advised, by top ghost hunters in the field, to take a regular camera that uses film as well as a digital camera. The reason being, if something is caught and only digital pictures are available, it may lead others to believe it was altered. In addition to serving as valuable proof of a haunting caught on film, there are other benefits. First, the standard camera can serve as a backup if something happens to the digital camera, and vice versa. Pictures from both types of cameras can be properly investigated to determine that it is unique and not altered. By having two types of cameras, there will be no hesitation that the photographs captured are authentic. This can actually establish you as an expert in the field of paranormal findings. Just as cameras and digital cameras are important ghost hunting equipment pieces, so is the video recording equipment that you elect to use. Once again, you may elect to use a digital video recorder, but it is also best to bring along a standard video recorder as well. You may want to purchase a video recorder that actually records sound and comes with a dim guiding light. Not only will this allow you to hear any and all sounds that surrounded you during the ghost hunt, but the dim light can act like a guide in dark areas. In many cases where you feel as if you may have discovered something paranormal, the standard and/or digital video recording ghost hunting equipment can provide proof, and help to establish your credentials.